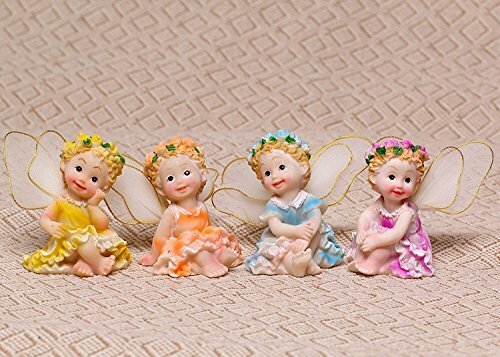 Tonsiki Resin Fairy Garden Ornament Home & Outdoor Decor Cute and Lovely Sitting Flower Fairies 4pcs Set by Tonsiki at List It Fort Worth. MPN: 4336447383. Hurry! Limited time offer. Offer valid only while supplies last. Build Your Own Fairy Gardens: This 4pcs sitting flower fairy set would be great to place in your garden, and it also can spark your children's imagination. Perfect Gift: This sitting flower fairy set makes a perfect gift for birthday, mother's day or other holidays or simply to SPOIL YOURSELF. All ages love it! Water Proof and Sun Resistant: Every piece in set is Hand Painted and has a protective coating to ensure that they don't fade in the sun and water! Note: Not for Children under 3 years old. If you have any questions about this product by Tonsiki, contact us by completing and submitting the form below. If you are looking for a specif part number, please include it with your message. Supply Guru SG2584 River Rocks, Pebbles, Outdoor Decorative Stones, Natural Gravel, For Aquariums, Landscaping, Vase Fillers, Succulent, Tillandsia, Cactus pot, Terrarium Plants, 2 LB. Large Size.